-last week i spotted a guy in a wife-beater and yankee cap jogging down my street in the early morning....with a poodle that couldn't have been more than 8 inches tall. -yesterday i thought i would try working in the cfa library so i went across the street, to where all the big-shot astronomers (except for me) have their offices. to get in you swipe your card, which i was told will give me access to this and anything else along the same lines. rejected. i think this is the worst rejection you can experience in life--rejection by a library. it reminded me of the seinfeld routine about how the library is like that unpopular kid who tries to loan out his toys to make friends: "...do you want to borrow it? it'll only cost you a nickel." not being able to gain access to a place i barely wanted to be in the first place is like being told by that kid that he has other plans and no, in fact, he will not be coming out to play. -i cannot emphasize this enough: i am a technically federal employee. the american public is shelling out tax dollars for me to attempt to gain access to libraries that don't want me there. i also have permission to read all sorts of classified government documents, and take it from me, we are just in Iraq for the figs. oops, i've said too much. -bob wilson, nobel prize-winning co-discoverer of the cosmic microwave background, has an office down the hall from me. since my thesis was on the microwave background's loser cousin, the neutrino background, (undiscovered), so i am completely awe-struck in this completely nerdy way. this was basically one of the first guys to make cosmology an observational science--his picture is in every astronomy text-book (run a google image search for "penzias and wilson" and tell me that that those arn't some wonderful photos). -at a cafe last week i overheard some lady at table next to me bragging about herself for about 15 minutes. as i got up to leave she began describing some summer day-camp she invented: "it is just what kids today need. it is 2 weeks of thinking outside the box and getting out of their comfort zones." "every morning would start with 15 minutes of listening to loud, exciting, pep-rally music and everyone would have to high-five everyone else." basically, she just went on like this spewing mindless catch-phrases and terrible ideas for activities while her breakfastmate listened, rapt with awe. -my girlfriend recently stated that her motto ought to be ‘always late but worth the wait’ due to her penchant for tardiness. i can already see fat middle-aged ladies wearing t-shirts with this slogan printed on them at air-shows and wal-marts. -state-of-the-art bioengineering routinely involves ‘chinese hamster ovaries.’ apparently this is such a common item that it is abbreviated 'CHO' in everyday usage. there is no point to this, i just thought it was funny. 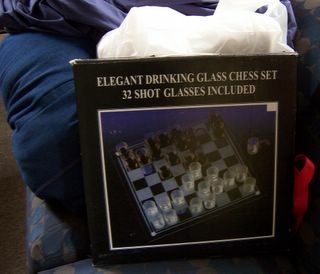 -for the man who has everything. while you’re online frittering away your money and sanity you can look into having your remains compressed into a gemstone by lifegem.com. this would be of particular value if you are interested in continuing to inspire bickering and discord from beyond the grave when one of your family members inevitably loses it. as someone not planning to have a portion of his cremated biological material purified in a high-nitrogen, low-oxygen atmosphere, converted into graphite powder at 3000 °K, combined with coloration chemicals, crushed repeatedly in a diamond press (“the more times in the press, the larger the diamond that results”! ), cut, etched with lasers, then “inspected, graded, and identified by world-renowned gemologists” (the same certification process used by the world’s finest jewelers! ); the company’s slogan, “love lives on,” certainly seems a little taunting. *nonetheless, i am curious as to how they organized the rules of this game—despite my best attempts i have never figured out how to make chess a drinking game. come with me for a minute. i want to talk to you. excuse us. i just want to say one word to you--just one word. are you listening? how do i mean? there is a great future in plastics. think about it. will you think about it? enough said. that's a deal. 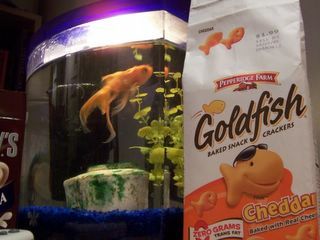 the namesake of this website, my goldfish, who inspired the non-sequitur title through his frequent resillience, has finally passed away. although he may have been a very small pet, he was a constant presence in my life for three years. watching him swim around next to my desk never failed to cheer me up--and merely by being there he managed to give me much more than he was aware of. he intrepidly logged hundreds of miles going back and forth from school, and took most of the sting out the transitory nature of my college existance. over the course of his life, he lived in seven different rooms and bounced back from countless illnesses that would have done in lesser goldfish. if it is possible for a fish to be enthusiastic, he most definately was; and it was always comforting to see that, pre-frontal cortex or not, there was at least one creature who was always happy to have me around. i certainly felt the same way, and i hope that somehow, he knew it. i suppose god only helps those who don't expect him to stop them from doing incredibly stupid things. couldn't this guy have just tried asking god to prove his existance through some non-life threatening method and stopped believing in him when nothing happened, like the rest of us...in kindergarden? this reminds me of when all those miners were trapped in that collapsed mine last year and a newspaper prematurely printed some headline like 'god answers family's prayers' a day before everyone found out that almost all of them died. the next edition should have printed a retrataction headline: 'god spurns miners, ignores prayers, or doesn't exist.' i guess media fairness is too much to ask. "ryan m---- as phonetics expert professor henry higgins brings a light and comic breeziness to his callous disregard for the condition of womanhood. he struts, brags, complains, and bemoans with conviction, all the while keeping his own focused concerns high above most of the life surrounding him..."
i've fogotten how funny that review was. the same callous disregard i reserve for actual women? "brags, complains, and bemoans"? wow, what a stretch for me...what tremendous range i had as an actor! comparisons to my actual personality are purely coincidental. it made me think about the other fine performances in that accomplished acting career of mine. there was this shout-out i got for 'a funny thing happened on the way to the forum', wherin my "lust was thwarted by old age and shrewish wife." how flattering. i couldn't find a link for it, but when i was in 'the elephant man' i remember that the part of the article that was printed on the front page ended with "in one scene however, m---- stopped acting..." essentially giving me a heart attack. then there was a 30 second pause where i was frantically flipping through the newspaper, trying to find the rest of the piece. "stopped acting...because the play was over. thank god, what a terrible performance." or "stopped acting...and dropped his pants. it was weird." it ended up being something like "...and fell into the role of dr. treves* so that for a moment there were no longer actors and a stage." which sounds nice at first, until you realize that it's just a backhanded insult. i was good for a "moment"? how long did i "stop acting for"? a minute? an act? what that comment was really saying was "hey, really great job during that brief interval where you didn't stink!" how would he like it if i came down to where he worked and knocked the pen out of his mouth? it'll only take a moment. *treves lived down the street from higgins. talk about typecasting, they had me down to characters on one london street. maybe that range wasn't so great after all.